Located in a fast-developing area just south of Hendersonville, North Carolina, the Mary Mills Coxe House sits on a 1.8-acre tract with wooded edges. It faces west across a shaded lawn towards the Greenville Highway, formerly known as the Flat Rock Road. The property is bordered on the north and south by other residential properties, some on wooded lots. Behind the property, to the east, is a partially-wooded trailer park. Across the Greenville Highway are mid- and late-twentieth century commercial properties. An asphalt-and-gravel driveway enters the property north of the house, continues deep into the lot, and circles around to reach the porte cochere. At the rear of the property is a carriage house contemporary to the house but altered unsympathetically, and two later, non- contributing buildings. A low, curving granite wall forms a front entrance to the property from the road, which, at the time the house was built, was a gravel road with banks on each side and a dirt path atop each bank. Built ca. 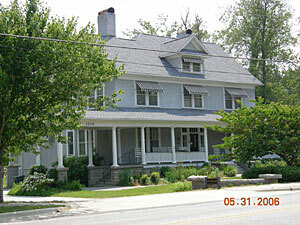 1911 as a single family residence, the Mary Mills Coxe House is notable as one of only a handful of pebbledash houses remaining in Henderson County. The house itself is a two-and-one-half-story frame, Colonial Revival-style dwelling set on a raised basement and stuccoed with pebbledash siding. Pebbledash was made popular in the area by Richard S. Smith, who came to Asheville with Richard Morris Hunt to supervise construction of Biltmore House. Pebbledash is a rough-textured stucco, an architectural concrete aggregate called "roughcast" by architect Smith. The house is three bays wide with a two level side-gabled roof, a pedimented front dormer, and a rear gable ell. The roof is sheathed in pressed metal shingles and pierced by three interior brick chimneys. Pent roofs characteristic of the Colonial Revival style are applied directly to the walls of all gable ends enclosing the gables. Deep overhanging boxed eaves with beaded-board soffits and frieze are on all sides of the house. At the front (west), a one-story hip-roofed porch wraps on the south side and extends to the north to create a porte cochere. The high foundation is of rough cut, regular coursed granite that matches the wide front granite steps and the steps leading from the north end of the porch beneath the porte cochere. It is similar to the granite of the low front entrance wall. The house has little decorative detailing, with the emphasis of the front (west) facade on the porch and central entrance. The large porch is formed by fifteen columns with simple Doric caps and bases supporting an unadorned entablature and asphalt hipped roof. The ceiling is of beaded boards. The wide overhangs of the main roof are repeated beneath the porch roof. A wood wheelchair ramp, sympathetically designed to reflect the square picket balustrade of the porch, was added to the south side porch elevation in 1993, and rotted column bases were replaced in kind. The three-bay form elevation is symmetrically balanced, with a central doorway and paired nine-over-one windows on the first level. The front door with beveled glass is set within a broad, three-part molded frame. Four-light sidelights above paired panels and a three-part transom with eight small lights complete the composition of the central entrance. The top of the transom and of the front windows abut the crown mold of the porch. Typical of the Colonial Revival style, the second-story fenestration is of similar but smaller paired windows in all three bays. The side elevations of the house have paired nine-over-one windows at the frontmost bays and single nine-over-one windows at the rear bays at both levels. A flared-roof bay window projects on the north side just behind the porte cochere, and another near the back of the south elevation projects onto the wrap porch. The north side elevation of the rear ell has nine-over-one single windows at both levels. In the attic level, the original nine-lighted fixed sash in the front dormer windows and side and rear gable windows were replaced in 1993 with single-pane sash. The sills of the attic windows rest on the ridge line of the pent roofs, while the second-floor windows seem to hang from just beneath the frieze, and those on the front and south side elevations rest on the porch rooftop. At the rear (east) elevation at basement level are two six-over-six windows replaced in 1993 to match the originals and a doorway beneath the back porch. Across the rear of the house is a two-story shed-roofed porch with enclosed upper-level sleeping porch protruding from just beneath the pent roof of the rear ell. Of odd configuration, it appears originally to have been a one-story porch. The porch is supported by granite piers similar to the roughcut granite of the foundation, with lattice screening and a new wooden stair built in 1993 to replace what was then existing. At the first floor level, four square posts support a plain wide frieze. Decorative sawn purlins are exposed on each side. The second story extends beyond the first floor on all sides, supported by three sawn curved brackets more closely resembling false knee braces and similar to the purlin ends. Two slender square wood posts provide additional support at the protruding corners. This early alteration created an enlarged upper porch level that was converted into a sleeping porch with vertical beaded-board wainscot and a ribbon of six-light windows on all three sides. The single-hung sashes open down into the wainscot. During the renovations of 1993, pebbledash siding matching that of the exterior was found on the rear wall of the house at the second-floor porch level. A center partition was removed and the eight-inch floor incline typical of porches was made level. In addition, the rear eaves of the porch were reduced from about a three-foot overhang to a two-foot overhang. The interior of the Coxe House follows a modified center hall plan. Rising along the rear wall of the hall is an open string stair with a gracefully curved, rounded oval handrail and turned and tapered Colonial Revival balusters. The stair turns at a lighted landing before rising to the second floor. The newel is a composite of a turned central baluster, more Victorian in nature, ringed with the more delicate turned balusters of the balustrade. Beneath the stair is a paneled closet door. Immediately behind the front staircase is a small stair hall with two sets of enclosed back steps, one leading down to the basement and the other, the servants’ stair, to the second floor and attic. Access from the wide central hall to each of the front formal rooms is through tall pocket doorways. On the north side is the dining room with its bay window and, behind it, the pantry and kitchen. A later bathroom built into part of the pantry opens into the hall behind the dining room. On the south side are the large living room and smaller library with bay window. The first floor rooms and hallway have fairly simple door surrounds typical of the first decades of the twentieth century. In the hallway stairway and three formal rooms of the first floor is a wainscot of recessed vertical panels with inverse molded trim. Windows exhibit the same surround as the doors, with the wainscot continuing as a low row of panels beneath the sills. All doors on the first floor have six recessed horizontal panels on both sides, with the exception of the taller seven-panel pocket doors. Fairly simple Colonial Revival mantelpieces are found in the three formal rooms, the most decorative in the two front rooms. The picture rails are original. A servant buzzer system, no longer operable, was wired throughout the house. The built-in desk and bookshelves in the library are later additions. On the second floor the hall opens onto three front bedrooms, a smaller back bedroom, and the servants' stairhall which in turn leads to the sleeping porch. Door surrounds, doors, and picture rails are similar to those on the first floor. The panelled wainscot of the lower level is replaced here by tall baseboards with simple top molding. Mantelpieces in the front corner rooms are of Colonial Revival style with slender fluted classical columns on plinth blocks. The interior of the house is a coherent whole and retains to a remarkable degree its floorplan, mantels, woodwork, hardwood floors and plaster walls on both levels. The 1993 renovation modified bathroom and service areas, but retained original decorative elements and structural material. Beneath the house is a full basement with earth floor and freestanding supporting beams. Carriage house. Non-contributing, ca. 1911. Major Theodore G. Barker, a Charleston lawyer, bought Brookland Manor in Henderson County, with its 1841 summer house, in 1882. Barker acquired land throughout the 1880s and 1890s, including land his wife had inherited, until they became some of the largest land owners in Henderson County. During the same period, he and wife Louisa Preston Barker sold many parcels as well. Years before his death in 1917, they had sold off their Flat Rock Road frontage as individual parcels, including the 1907 sale to Mary Mills Coxe, widow of Colonel Franklin Coxe. Colonel Franklin Coxe, who died four years before his widow bought this land, was credited with the late 19th century boom in Asheville. Asheville, about 25 miles north of Hendersonville in Buncombe County, had seen explosive growth in the 1880s in large part due to the efforts of Colonel Coxe. Coxe had been president of the Commercial National Bank in Charlotte and in 1881 became vice president of the Westen Carolina Railroad, the pioneer railroad company of the mountains. He contributed private funds to construction of the railroad to Asheville in 1885. Coxe invested heavily in western North Carolina real estate. He built Asheville's Battery Park Hotel, "the first modern hotel in the state," which opened in 1886. It is said it was from this hotel that George Washington Vanderbilt saw the Pisgah Mountains and decided to build his Biltmore Estate. A decade after Coxe's death the Asheville newspaper reported that “…he had come to Asheville when it was a little town unknown to the world and with confidence and judgment which inspired others built the Battery Park Hotel and in doing this and by his influence and energy had given Asheville an impetus to its career or progress and advertised it far and wide as the premier health resort.."
Coxe owned timber lands in North Carolina and anthracite coal mines in Pennsylvania. He had property in Knoxville and in the Okefenokee Swamp. He was elected president of the Charleston, Cincinnati and Chicago Railroad. He acquired large tracts of land in the Montford section of Asheville and made heavy investment elsewhere in western North Carolina and, the Asheville Citizen reported, "all of them were profitable." Mrs. Coxe died late in 1914 and her five children sold the house in 1917. The house was bought in 1920 by the Wharton family who held it for 43 years until 1963. The house was known as "Gray Gables" during the Whartons' ownership, though it is not known whether the name originated with the Coxes or the Whartons. James B. Wharton was a merchant from Greenwood, SC, who first summered here and later moved to this house year-round after his retirement. After changing ownership four or five times, the property was purchased in 1993 by Flat Rock Limited Partnership, a construction and development firm.